Between its massive population and booming economic growth, it’s no surprise that China is experiencing a shortage of land. What is surprising, however, is how China is handling the situation. The country is opting to literally decimate mountains in order to clear more space. Mountains, particularly those adjacent to urban areas, are being leveled to enable construction on the newly flattened terrain. Obviously, obliterating mountains is not an easy, cheap, or quick undertaking. Nonetheless, that hasn’t stopped the Chinese people from rushing to take down the mountains. There’s a reason that “moving mountains” is an expression that connotes a near-impossible feat. However, teams with no experience in mountaintop removal have helmed these projects, thereby practically ensuring that major mistakes will be made. While it seems like an ecological disaster in itself to alter the landscape by getting rid of mountains, the environmental consequences go well beyond aesthetic changes. The destruction of mountains has already caused dangerous and unanticipated landslides and flooding. Once reliable water sources have been both polluted and diverted due to the change in landscape, too. Plus, as if the sky in China weren’t dingy and unhealthy enough from pollution, now the air is literally brown from the dust that is rustled up. Mountain demolishing began in the city of Yan’an months before any research on the environment was conducted. Belatedly, experts discovered that the area’s mountains were comprised of “thick, million-year-old deposits of windblown silt.” As a result, this surface is unsound for constructing buildings upon; whether people will choose to build on this unsafe ground anyway is not as clear-cut, sadly. Thus far, the government has faced criticism for prioritizing immediate economic development over enforcing environmental regulations. In the meantime, animals are threatened, habitats are lost, and several creeks have disappeared altogether. It is also reasonable to expect that nearby residents will suffer health consequences. About 20% of China’s citizens live in mountainous locales. American research found that those living near mountaintop removal sites developed cancer at significantly higher rates. While Nature, an international weekly journal of science, is fretting these projects for many of the aforementioned reasons, it is further troubled by the fact that workers aren’t even putting in minimal efforts to avoid exacerbating the problems. Laborers have been told to wet the dirt in order to minimize air pollution, but even that simple directive is often ignored. 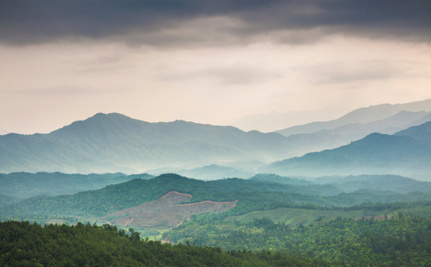 Unfortunately, because this sort of mountain removal is unprecedented, experts can only guess at the kind of long-term repercussions the Chinese environment will experience. Given all of the immediate consequences the local human and wildlife populations have already suffered, however, it’s difficult to imagine that this plan is the right way to go about creating more space for buildings. China really doesn't use much common sense when it comes to many issues and this one is no different. One thing I am kind of surprised about is that they are over-populated (tic). I would have figured all the melamine in the rice and baby formulas would have kept the population in check. But it seems that the only populations sufferening from that is our dog populations. They really need to think more long term and stop destroying their country. sigh. sometimes I think about how much better off this Earth and all the living things on it would be better off after all we humans die off. sigh. What good is it to make room for more people, if they have no oxygen to breathe? We need to slow down population growth. Sadly, China is engaging, obviously, in a lot of activities that make no sense for their people - including allowing dead animals to float down rivers that are used for drinking, pollution so bad that people literally almost can't see ahead of them, and now leveling areas when there's no one who can afford to live there. I'm not sure WHY they continue on this road, and what it will take to get them to re-think what they're doing. Why, do you think to hear all that "BS" on and of China? THEY have learned Capitalism and perform it way better than the USofA. When I was traveling the USofA 1998, nephew Sebastian asked me to bring him some of these then STYLISH »Tommy Hilfiger« things "because these are certainly much less expensive than in Hamburg (germany)". 1st  them being expensive too, in the USofA. 2nd  every single item branded "Tommy Hilfiger"  also showed the Mark "made in PRC". As a result of this manifestation of greed, China accumulated so huge amounts of US$s to plainly BUY the USofA or at least ruin it. We, the 99%, need to recognize that the current problems we face, are neither Chinese or American, nor African or European problems, but problems of mankind as a whole. What we need is a complete redesign of our culture  front up a re-definition of what can appropriately be under the rule of private property  the air you breathe?  the water you drink? → you name it ...  why do we allow it to be spoiled / polluted  the last remains declared private property and sold for profit?  o.k. it's harder to accomplish with Air than it is with Water. But at least you might have noticed that the preparations are well under way → air pollution  and even seafood  not only but lately by Fukushima desaster.
" We should give it a try. or, as a famous quote goes: "You're not only responsible for what you do, but also for your neglect"(or for what you let happen without your (fierce) resistance).